For a good few years now, both consumers and the entertainment industry have been pointing out how much TV shows are superior in quality to movies at a local multiplex. For every new superhero movie, from Superman to X-Men, there has been some new TV show that surpassed them in terms of entertainment value, amount of audience, intellectual scope, and quality of actors and writers who contributed. Think of the worldwide phenomenon of Game of Thrones, and Sherlock (the one with Benedict Cumberbatch, not the old tweed versions), Orange Is New Black and Star Trek for the millennial crowd, and Downton Abbey and The Crown for the more genteel audience. Downton Abbey is also a good representative of a niche within popular shows – that of a British TV drama. This category immediately evokes quality: excellent British stage and film actors, engaging and ambitious writing, and an impeccable design of costumes and sets, especially in historical dramas. Audiences worldwide have been accustomed to expect these traits from a British show and they are rarely disappointed. Within this category, there is another trend: political thrillers. Within last couple of years, there have a quite a lot of British shows that have several things in common: an excellent casting and writing as a rule, but above all a more mature and modern way of describing the current political world. Last year’s The Night Manager is a modernized adaptation of a classic John Le Carre’s espionage novel. While the book, written in 1993, was centering on arms trade deals between Anglo-American intelligence community and a Colombian drug cartel, the TV version is set during the Arab Spring of 2011. Arms dealing is still there as a source of wealth, stealth and violence. Tom Hiddleston stars as a night manager of a luxury hotel in Egypt during the last days of Mubarak regime. He comes across some information about a major arms sale by a Brit called Roper- the information is obtained at a price of blood. The death of an innocent woman haunts him so hard that he decides to stop the dealer when a chance meeting offers him access to this secret and dangerous world of weaponry trade. The 6-part miniseries excels in what a film adaptation would not be able to provide – a nuanced portrait of all characters. A British spymaster (who unconventionally happens to a pregnant, disheveled woman with a razor mind), is dedicated and clever in her pursuit of Ropers arms trade but is she really without blame when her mistakes lead to death of her informants and endanger her employees and bystanders alike? Is our title character really so righteous, when he decides to stand up to a warmonger out of personal revenge and he keeps killing in the name of Her Majesty? These and many other moral and political dilemmas are presented here and as an added bonus, we get a realistic insight into the lives of the superrich. This isn’t your mother’s Bond movie and there isn’t a bevy a Bond girls in sight anyway. Roper belongs to the world of money and power, no matter how gained. These are people who travel the world with functional entourages (a security team, a money manager, a lawyer, a girlfriend but only one, plus a lot of quiet house staff) – nothing too ostensible but everything discreet and well organized. Wealth usually implies efficiency not ostentatiousness. This is what makes the show believable- how a private life of the rich really looks, how arms deals could be organized, and with whom and why. While the show simplifies the novel somewhat and provides a satisfactory ending that life usually does not, it is still a very rewarding story to watch. 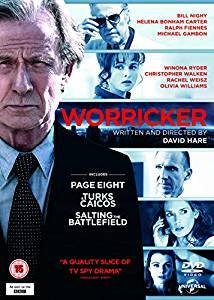 An in-depth commentary on another important British TV show and its political implications has already been posted in the Solari Blog in 2015: The Worricker Trilogy. However, since some readers may have missed that posting, we are talking again about the show, this time in a context of the latest shows from the U.K. and an intellectual value they offer. So, here it is, The Worricker Trilogy again being recommended. Johnny Worricker is a professional spy: “a civil servant from the Ministry of Fisheries and Agriculture” as he calmly introduces himself to strangers on a Caribbean island. He is a nice Brit on vacation who also happens to be on a run from his prime minister (a character clearly modeled on Tony Blair), his uncompromising female Home Secretary (think Margaret Thatcher and Angela Merkel rolled into one) and his MI5 colleagues. All this because he got hold of a file that links the prime minister to a company that built CIA’s secret interrogation camps all over the world. In real life, there so much more to the story (see above) but the practice of “extraordinary rendition” has really made fewer headlines than it deserved. For example, when the CIA camp scandal broke out in Poland where one of these camps was located, the story was extinguished in the local media very effectively. And the reason why such media coverage does not have a long trajectory is very obvious in Worricker. We watch all the political wheeling and dealing, the ways truth gets negotiated down and the price people pay. A TV miniseries format is ideal to create a slow reveal of a story within a story, peppered by some incredibly smart exchanges between politicians who can toss hardballs with press and political adversaries faster than the squash ball they aggressively smash in their spare moments while plotting the next obfuscation. The Last Panthers, a co-production between the UK and France, brings in a very bleak look at the underbelly of Europe, the world that the locals try to ignore and the tourists never see. It is an intricate story of two protagonists –an English insurance investigator and a French-Algerian policeman from Marseille on a hunt for stolen diamonds. Their separate investigations converge on Serbia, a country in throes of transformation from the 1990’s war atrocities to a new capitalist world of European Union-sponsored affluence. But there are new players in Europe these days. A significant exchange takes place in one scene between a British investor rep (excellent John Hurt) and a Serbian politician who refuses to get rid of a thug who will oversee security at an airport construction. The politician bluntly tells his investor that the British do not call shots in this deal. If they do not like the Serbian “security” staffing they can leave the project because there are even better Chinese investors available just around the corner. In the view of the recent Belt and Road Initiative’s investments in no other place than Serbia, this is a poignant scene. Movies make very good canaries in a mine. All these British productions have something in common: they are not traditional TV. They are designed as self-contained miniseries- once the story is told, there is no forced effort to come up with more plot for the sake of a next season. They all have a cast of major stars who would never have time for a multi-season series but have happily signed for these one-offs: Bill Nighy, Tom Hiddleston, Helena Bonham Carter, Rachel Weisz, Olivia Colman, Ralph Fiennes, Tom Hollander, Hugh Laurie, John Hurt — the best of the British talent. Add to this smart writing and accurate research, and realistic art design (take a look at the recreation of the Egyptian street riots or Caribbean beach scenes). In such setting, the story is believable when it deals with hidden activities and unspoken evils of modern political and military world. Intellectually, it feels like a breath of a fresh air after the artifice of The Hitman’s Bodyguard (admittedly a comedy), Kingsman (lots of fun but not much insight in the actual world except may be the church massacre scene which has implications of its own – see previous Solari postings) or Salt (Angelina Jolie battling FSB assassins in New York- again fun to watch but not really informative as to current US-Russian counterintelligence moves). For an audience to feel informed or at least entertained without having one’s intelligence insulted, the British shows are the way to go. We get joy from connecting the dots, we can watch the best there is in acting, and we can sometimes actually learn some tidbits of how things are really done.